Covers The Largest Night Sky Area On The Market It is fully weather proof as it is constructed of T-6082 aluminium alloy and is black hard anodized. Welcome to the AZZOMAT website ! Azzomat founded its roots back in 1991 when owner, Joseph Azzopardi, set up a small engineering shop to cater for general engineering works. In 1998, the shop was moved to a larger facility where by 2013 additional equipment was gradually added. Owing to the interest in astronomy and astronomical equipment, Joseph was inclined in designing astronomical equipment and improving on others already in the market. The additional equipment in his workshop helped him to attain his goal and led to the introduction of the GM-20 in 2014. Considering the low exposure done to the GM-20’s introduction and interest shown, he set out to design the XL series mounts in late 2016 following continuous research to improve the products and inputted recommendations by customers during the past three years. The XLF was designed to cater those clients who needed an affordable, strong, lightweight and play-free mount. ●	A more affordable mount than those found in the market. ●	Can hold weights up to 3kgs to take on the most popular OTA’s (optical tube assemblies). ●	Be able to mount with minimal or no DIY modifications on main telescope. ●	Be of low weight so as to minimize counterweighing problems. ● Introduced a standard integrated ‘V’ clamp/ azimuth drive system at the top end of our guidescope mounts. 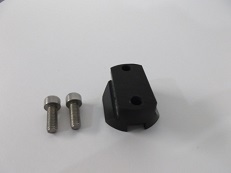 ● Added a standard camera insert allowing the mounting of equipment with standard ¼” 20TPI UNC thread. ● Designed to safely retain weights up to 4kgs (9lbs). ● Retained the laborious full anodized body anti-corrosion procedure. ● Retained full stainless steel hardware. ● Re-designed the azimuth controls to eliminate backlash completely, yet remained adamant not to introduce plastic derived components. All these led to the XLF mount design which caters for all the above points. We will now take a closer look at this model and describe further the advantages it offers. Similar to the previous model (GM-20), all aluminium components are anodized for a durable finish and all hardware is made of stainless steel. The livery colours are retained as those of the GM-20 mounts, that is, black anodized body with red anodized controls. However, there is a small exception in that the body is now no longer matt black in colour but flash black. This measure was taken so as to avoid the minute variations created during the etching process prior anodizing. The concept behind the trusted livery is that there is no need for the mount’s body to stand out at night. On the contrary, the adjusting knobs will, when the usual night-friendly red illumination is used. The end result; a practical, eye-catching and precise piece of equipment. The XLF model can readily be affixed between the main telescope or a tripod and a guide scope or camera, right out of the box using the ¼” UNC thread at base or directly by two M6 bolts. 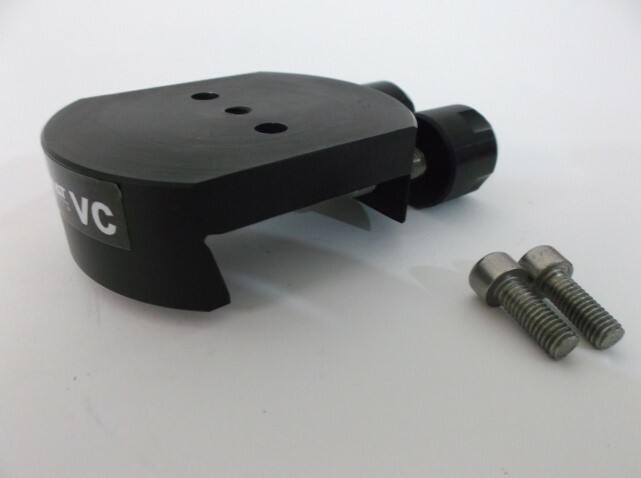 ● A shoe dovetail, to affix the unit to a readily available shoe bracket on your telescope. ● And a 45mm (‘V’ type) base clamp to mount on tube affixed ‘V’ type rails. The XLF guide scope mount is equipped with a ‘V’ type clamp at the top with an integrated azimuth drive. The integrated azimuth drive allows the ‘V’ clamp to turn together with the attached equipment, therefore having the azimuth drive always conveniently positioned at right angles. Another advantage is that the final mount’s weight is reduced as there is no need for an intermediate plate. ● Excellent weight to load ratio. ● More load capabilities for your invested money. ● Guaranteed sturdy construction and exemplary backlash control. ● The integrated azimuth clamp knobs are always located at right angles to the attached equipment. ● Anodized black body and red control knobs and stainless steel hardware throughout. ● No plastic or plastic derived components are used as these tend to wear or deform by time. We urge you to read all the material on this site and then try any derivative of your choice out for 15 days. If not satisfied; just send it back and have the full item price refunded, no questions asked. If you decide to keep the unit, it carries a 2 year warranty to keep your mind at rest that you made the right decision.